My first beer was a Miller in 1965. I drank it behind Our Aunt of Jesus Catholic Church. Two more followed fast. The contents of the three bottles disagreed with my stomach and I spewed out the beer like a whale breaching the surface of the ocean. On the following Sunday the pastor dedicated his sermon to the evils of teenage drinking. His words came too late for me. I had already vowed to never again drink beer. That pledge was later adjusted to restrict Miller beer from touching my lips. My friends were fans of Bud, but something was off about beer hauled by the Clydesdales and I only drink it when there is nothing else available like at MLB baseball games and barbecues in Iowa. Schlitz on the other hand slid down my throat as smooth as a vanilla milk shake on a hot summer day and I remained faithful to the beer that made Milwaukee famous throughout my teens. Over the years I’ve drunk Olympia, Coors, Busch, Iron City, Narragansett, Carling, Labatt, Molson, Pabst, and hundreds of other brews, until American beer was wiped off the menu by Heineken. Soon I extended my exploration to foreign shores to taste the beer in their native surroundings. I drank Corona in the Yucatan, slugged down Karlsberg in Denmark, swilled 1664 in France, quaffed Tiger in Malaysia, soothe my thirst with Bintang in Indonesia, and savored Leo in Thailand along with beers from every country in between. I even created a special holiday for beer. Beermas sounded good to my ears. I celebrated it almost daily with pleasure. I returned from overseas three years ago. My favorite bar was five blocks from my apartment. The lovely Chinese bartender served cold Stella-Artois in a glass. The clientele became my friends. I had downed several thousand at Frank’s Lounge on Fulton Street from August 2009 to September 2011. I left the USA for Luxembourg to further my knowledge and told my fellow drinkers at Frank’s that I would return a better man, because my next destination bordered Belgium and nothing goes down better than the Trappist beers of that country. Leffe, Duvel and Stella Artois are good supping beers, but they pale in comparison to the Achel, Dubbel, Chimay, Orval, and dark Rochefort. None of them are under 7% alcohol. 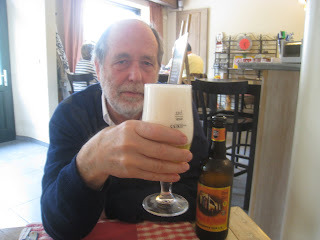 A month ago my good friend from Florida Vonelli conducted a tour of a Trappist monastery south of Charleroi. We were two versus a couple of hundred bottles of beer on the walls. The abbey was in ruins. Not a single monk inhabited the property. Abbeye d’Aulne was served at the nearby restaurant overlooking the canal. We had a fine meal of fish. Three courses cost $30. We drank three beers. I had never tasted better and we ordered a fourth. “What I like about Belgium is seeing little old ladies drinking beer in the cafes at noon. It make me feel good.” Vonelli has been living in Belgium for a number of good reasons. Beer was one of them. “That’s the only reason you live here?” The first sip of the fourth glass was as good as the fourth sip from the first beer. “That and the beer.” There were other attractions and one of them was Charleroi, the ugliest city in all of Europe. It also has good beer. Beer is Belgium as much as frites with mayonnaise. In fact beer was so popular in Belgium that a low-alcohol version was served in schools up to the 1970s. For lunch I’m drinking a Duvel for lunch with Cod fried in olive oil. I have no heavy machinery to operate in the afternoon or tomorrow either. This entry was written by Peter, posted on January 24, 2017 at 12:33 pm, filed under 2010s, Drinking, europe, religion and tagged abbaye d'aulne, belgium beer, research. Bookmark the permalink. Follow any comments here with the RSS feed for this post. Post a comment or leave a trackback: Trackback URL.